The Philippine Social Security System (SSS) is a state-run, social insurance program in the Philippines, it administers social security protection to workers in the private sector and promote social justice and provide meaningful protection to members and their families against the hazards of disability, sickness, maternity, old age, death and other contingencies resulting in loss of income or financial burden as part of their Mission. A compulsory coverage is the mandatory registration of employees, employers and self-employed persons with the SSS, with corresponding payment and remittance of social security contributions. But, covered employed members are entitled to a package of benefits under the Security System (SS) andEmployees’ Compensation (EC) Programs in the event of sickness, maternity, disability, old age, and death. Self-employed and voluntary members also get the same benefits as covered employed members, except for the benefits under the EC program. Basically, the SSS provides for a partial replacement of income lost on account of the aforementioned contingencies. 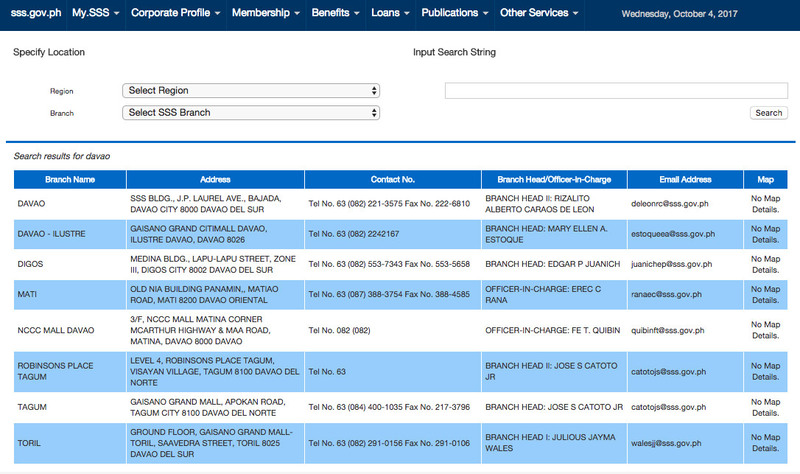 In this article, I will teach you how to get into SSS Branch Directory that is available on their website. As long as you have an internet connection, in a few clicks you can easily search SSS specific Branch Location. apply for your Unified Multipurpose ID (some branches only) etc. Follow these simple instructions below to search SSS specific Branch Location here in the Philippines and abroad. 2. 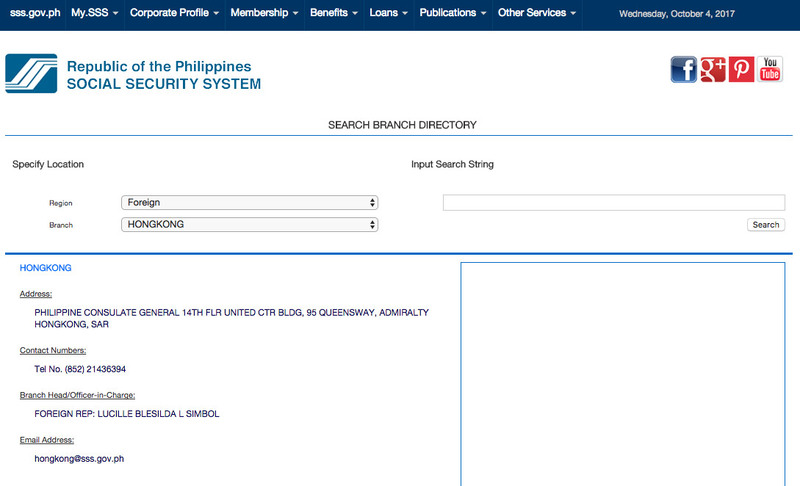 Under SSS Website homepage you don’t need to login, just hover your mouse cursor lower right then click Branch Directory. (See the screenshot). 3. You’ll be directed to SEARCH BRANCH DIRECTORY, under Specify Location, select Regions like NCR, Luzon, Visayas, Mindanao and Foreign or you can use the Input Search String. 4. After you select a specific Region, the system automatically generates the available SSS Branches. You can also search directly on the Input Search String box at the right side. 5. Finally, you will get SSS branch address, Contact Numbers, Branch Head/Officer-in-Charge and the Email Address. You will see result like this when you use the search option. And also SSS expanded by creating more venues to get in touch with all members. As promised, they will attend to our queries from Monday to Friday at 8:00 am to 5:00 pm (Philippine Time) at their official Facebook page: https://www.facebook.com/SSSPh . According to them, this site will be updated with the latest news and basic SSS information for all member’s welfare. I hope this article serves a little help, particularly for beginners online. You may now visit, call or e-mail SSS office anytime. Where to Download or Play Flappy Bird?